David Brin, who talked about romanticism and how it relates to fantasy, and about keeping protagonists in jeopardy even when they live in a civilizations full of helpful people and regulated emergency services. He also does some Yoda-hating, which is pretty great. And Scott Sigler, who talked about belief, critical thinking, pseudo-science and skepticism in science fiction. I’m no sports-fiend so I never got around to reading his Galactic Football League series, but the way Sigler talks about sports in this interview has convinced me I should. The character arc sounds interesting too. Last year, Rationally Speaking also had a science-fiction episode where they discussed philosophy in science fiction and recommended some stories with cognitive-science and philosophical themes. Worth checking out for some interesting perspectives. And while I have you here!!! OK, this isn’t really science-fiction, but I have to recommend one more Point of Inquiry episode. 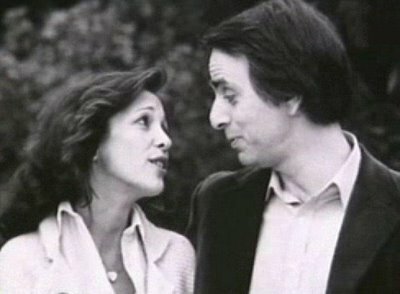 A long time ago, POI interviewed Anne Druyan about Carl Sagan, their relationship, his work, and his death. It’s possibly the most romantic and beautiful interview I’ve ever heard. It’s not just about science and spirituality but also about true love and appreciating the connection of two finite beings in a vast and timeless Cosmos. So nice.